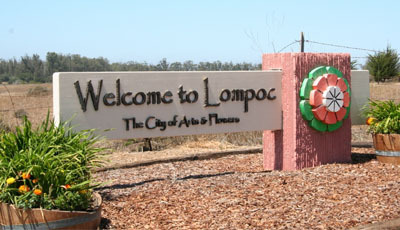 There are a lot of benefits to home window tinting for the residents of Lompoc. Our beautiful Central Coast is graced with terrific weather, with most days of the year bringing us sunshine. Our temperate weather is envied by many, but it also has a few pitfalls. All that sunshine brings with it very damaging UV rays, that are harmful to our skin as well as our household items like wood flooring or carpets, not to mention drapes and furniture! Often the weather will be quite nice outside, yet our homes are too hot, because of the trapped heat that accumulates through unprotected windows. Have you ever avoided watching TV during certain times of day because of the glare? or what about trying to work on you your computer or laptop? Sometimes we are so used to dealing with that irritating glare we don’t realize there is a simple solution! Apex window tinting film is the easy answer! The sun’s strong rays are not just an inconvenience, they also cause damage to our furniture, flooring, draperies, and other household belongings. Why risk devaluing your home and needing to replace costly items, when instead you can have Apex install window tinting films on your home’s windows? Did you know that even our skin is vulnerable inside our homes? Skin cancer is all too common these days and the evidence shows a link to the levels of UV radiation we are exposed to. Most people think to apply sunscreen when they go outside, but most of us don’t even think about the harmful UV rays that are reaching us through unprotected glass while indoors! Choosing to install residential window tinting will help dramatically reduce the UV rays that get into your home, making window film tinting a good choice for you and your home. Maybe you are more concerned with home security. Security Film is the window tinting choice for you. With Security window tinting film, glass fragments are not shattered as easily, making occupants safer and slowing down a would be thief. Security films are thick, from 4 mil. to 15 mil. This makes it much more difficult to get through, buying much needed time for help arrival. While we know nothing will completely keep out someone truly determined, it is wise to take precaution where we are able to! Think that window tinting for your Lompoc home may look too dark? It is often thought that window tinting will look too dark from the curb or make it too dark inside. This is no longer true. With the advancements made in this industry you no longer need to sacrifice beauty or natural light for the positive benefits of home window tinting! At Apex we work to achieve a healthy balance of desired natural light and added protection for each of our customer’s homes. We have window tinting film that will cut out little to none of the natural light you want, but will still reduce by up to 99% the UV rays from that light. Heat build up is also dramatically reduced as these films keep the heat from entering, not just providing shade, like a curtain or blind. Also they don’t block your view the way those things do, and help with energy costs. Maybe you have some problem areas of your home, like a window that faces a view you’d rather not look at, or a window that requires privacy. If you still want to let in light but want to block your view or the view of those to the inside of your home, then our decorative window tinting films are right for you! We carry opaque, frosted and one-way options to choose from. 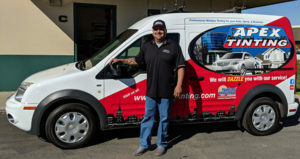 We’d love to tell you more about how Apex can help you with your Lompoc home or office window tinting needs!